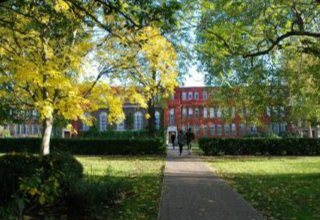 Regent’s University London is one of the UK’s most respected independent universities set in the heart of Regent’s Park in central London. With 11 acres of private gardens, the estate is a quiet, secluded haven in which to live and study. As well as a large and comfortable student common room, students can enjoy relaxing on the lawn, play sports and use the large grounds for group activities. Regent’s University London offers a number of meal choices, and can cater for most dietary requirements with prior notice (taken at time of booking). There is also a snack shop onsite selling sweets, drinks and savoury snacks. For residential students, accommodation is provided in comfortable bedrooms, with single & twin occupancy options. Staff remain on site 24hrs per day to ensure student well being and safety. ADDRESS: Regent’s University London, Inner Circle, Regent’s Park, London NW1 4NS. From Baker Street station – Take the Marylebone Road exit. Turn left and walk past Madame Tussauds to York Gate on your left. Turn left into York Gate. Continue over the bridge into the park. The University entrance is on the left. Total journey time approximately 10 minutes. Our main campus and Marylebone facilities are both off the A501 (Marylebone Road) in central London. Free onsite parking available. From London Heathrow Airport – Heathrow Express train service to Paddington station. London Underground from Paddington to Baker Street station. Total journey time approximately 35 minutes. From London Gatwick Airport – Gatwick Express train service to Victoria station. London Underground from Victoria to Baker Street station. Total journey time approximately 60 minutes. From London City Airport – Docklands Light Railway (DLR) to Canning Town station. London Underground from Canning Town to Baker Street station. Total journey time approximately 45 minutes. From St Pancras International – home to the Eurostar London Underground from King’s Cross St Pancras to Baker Street station. Total journey time approximately 10 minutes.